Students will love making and solving shape puzzles with these cuisenaire rods template clip art graphics so much they might forget they’re learning! 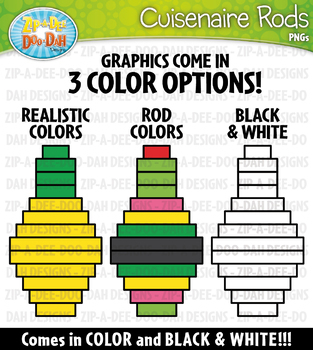 These are pre-made graphics will make your life easier when creating your own fine motor skills activities such as: cuisenaire rods, matching, mosaics, and color by codes. Each icon graphic pattern includes three color options which allows you to pick your own difficulty level; realistic color, matching cuisenaire rods colors, and B/W. The set includes a total of 30 images (20 Color and 10 B&W). The images are high resolution (300 DPI) which means high quality printing. Files are provided in only PNG format. For personal or commercial use – However, graphics cannot stand alone and must be incorporated into a resource. 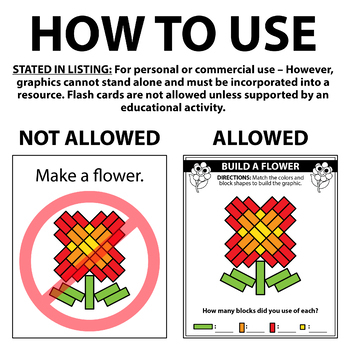 Flash cards are not allowed unless supported by an educational activity. 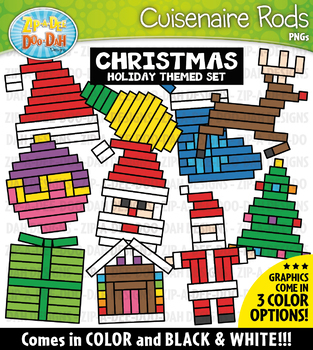 PLEASE NOTE: This set is included in the Holiday Wooden Block Rods Clipart Mega Bundle. Please don't purchase this set if you have already purchased the bundle because you already own this set!